This is not the first time I've seen these statistics. 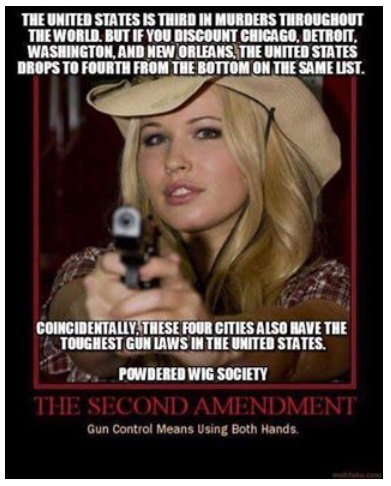 A month ago, at least three of my Facebook friends posted a graphic with the same statistics but without the blonde holding the gun. They've apparently been kicking around a while. Surely any intelligent person with a concern for the difference between truth and fiction would be wary of these statistics. The source is not given. Nor is there any indication of exactly how many and what countries are involved in these rankings. If there are only seven countries in the comparison, for example, then the country that is third from the top would be the same as the one that is fourth from the bottom! Where does America actually stand in a worldwide survey of homicides? The graphic refers to just “murders” rather than specifically gun murders, and one of the most convenient sources of murder statisitcs is the Wikipedia entry List of countries by intentional homicide rate. In the large table you can click the little icons under the headings to sort it by the various columns. If you sort this table by the Count column, which is the number of murders during the year, you’ll find that the United States ranks 8th among the 218 countries. But we might expect a high ranking because the United States has a fairly large population. It’s more instructive to sort by the Rate column, which is the annual number of murders per 100,000 population. You’ll then discover that the United States has the 111th highest murder rate among the 218 countries—almost exactly right in the middle. However, countries that have a higher murder rate than the United States are mostly in South America, Central America, and Africa, and also include Iraq, Afghanistan, Cambodia, and North Korea. Countries that have a lower murder rate than the United States include Cuba, Iran, India, and China, as well as Canada, Australia, Japan, the United Kingdom, Germany, France, Italy, and much of the rest of western Europe. For comparisons such as these, it is often more illuminating to compare the United States with other industrialized countries, such as the 34 countries that comprise the Organisation for Economic Co-operation and Development (OECD). Moreover, some people don’t trust Wikipedia — particularly when the numbers seem to them to reflect some kind of "liberal bias" — so let’s go to the original source: the Global Study on Homicide published by the United Nations Office on Drugs and Crime. Table 8.1 on pages 122 through 133 of this document lists all the countries in the world, and has both the number of murders and the murder rate per 100,000 of population. The United Nations Population Division website has a “2015 Revision of World Population Prospects“ that includes several spreadsheets. From the Download Data Files link I used the first Excel file: Total Population – Both Sexes. The population data is given in thousands, which means that the numbers have three decimal places. I simply transferred the 2011 or 2012 numbers (depending on the year of the murder data) to my own spreadsheet, which you can download here. As you can see, the United States is 3rd from the top, which agrees with the graphic with the blonde holding the gun. This is encouraging: We might be well on our way to reproducing the other statistics on the graphic. Now we need some murder statistics for the four cities cited in the graphic. For those, I went to the FBI Crime in the United States, 2012 site. This page lists all the states (and the District of Columbia) and within each state you can look up statistics by city. And we see that it brings down the total U.S. murder rate, but it doesn’t at all affect the ranking of the United States within the OECD countries. Of course, these four cities weren’t chosen at random for their use in these bogus statistics. These cities are well known to have large black populations. The implication of the graphic is that white America does not have a murder problem or a gun problem. Which means that the graphic not only expresses opposition to gun legislation, but is also overtly racist.